Southern Hemisphere Background Report For February 2016. Well, February 2016 had the highest month average since records have been kept here. This was a surprise to say the least considering the wind direction. The wind direction this time of the year usually comes down the East Coast of Australia, from the Northern tropics. Interestingly, most of the late February increases occurred when the wind direction was coming from South or SSE. Equatorial winds this year were drawn South from the Eastern Pacific, and then directed it up the East Coast of Australia. The East Coast of Australia surface wind direction for the later part of February is shown clearly at 2 minutes and 54 seconds into this Suspicious0bserver video. Caloundra February month average year comparisons. 2016 – was 41% above the 4 year pre-Fukushima local average. 2015 – was 30% above the 4 year pre-Fukushima local average. 2014 – was 40% above the 4 year pre-Fukushima local average. 2013 – was 39% above the 4 year pre-Fukushima local average. 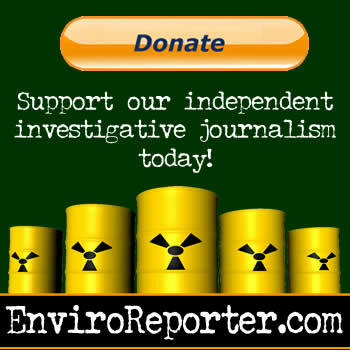 2012 – was 37% above the 4 year pre-Fukushima local average. Thanks to the Cairn’s station operator for providing this day average Cairns and Caloundra comparison chart. Cairns is red in this comparison chart, and Caloundra is yellow. The background levels here went up significantly in late January 2016. There was 2.47 times as much rainfall in January 2016 (133.6 mm), compared to December 2015 (54mm). Even with the increased rainfall, the amount of Pb-210 captured for January and December in the rain water filter, was approximately the same. Pb-210 is the end product of radon daughter decay. There was more Beryllium-7 detected in January 2016. This was probably created from spallation in the upper atmosphere, by recent solar storm activity. 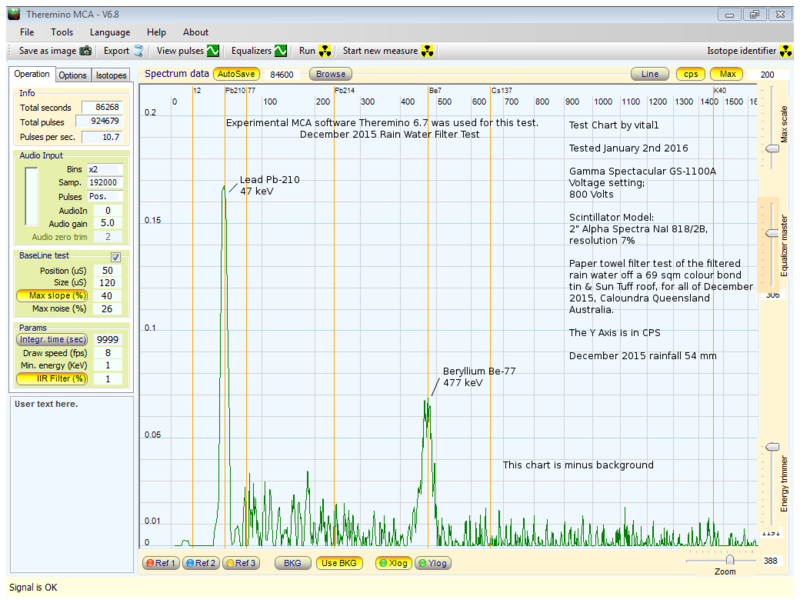 No detectable Cesium is being detected in the rain water filter tests. It is important to understand that when you look at a scintillator test chart like the one above, the peak highs can be deceptive. The Scintillator device used for testing the rain water filter, is less sensitive with increasing isotope energy. For example the scintillator may have ~50% efficiency near the low energy Pb-210 peak and ~7% efficiency near the mid energy Be-7 peak. So the maths tells us, that more Be-7 was detected than its peak high would indicate! 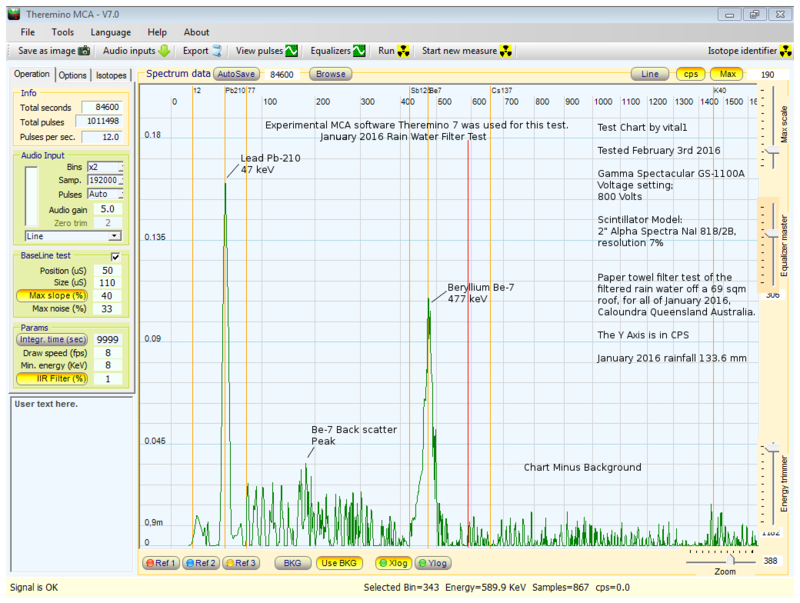 At best, the above chart is showing what was detected, it does not quantifying the amount. The January day average peaks at Caloundra were less than those recorded for Cairns, see the Cairns and Caloundra Comparison chart below. 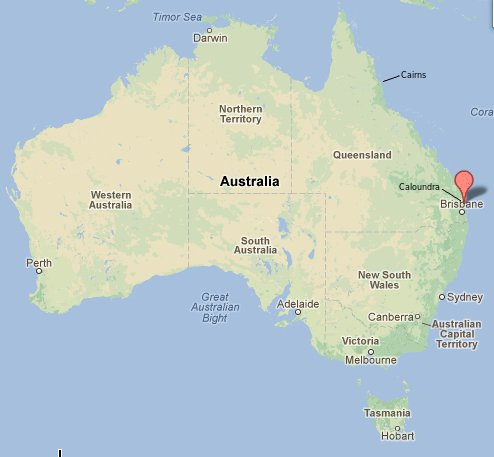 Cairns is a lot closer to the equator than Caloundra. Alert Caloundra 31th January 2016 – The background here has seen a steady increase during January, reaching 64% above average on the 31st January. The 24 hour, 60 second logging chart for the day, showed a significant increase in background levels between 9am to 2.30pm. It was cloudy, but not raining at the time. What the chart colour alert codes mean. 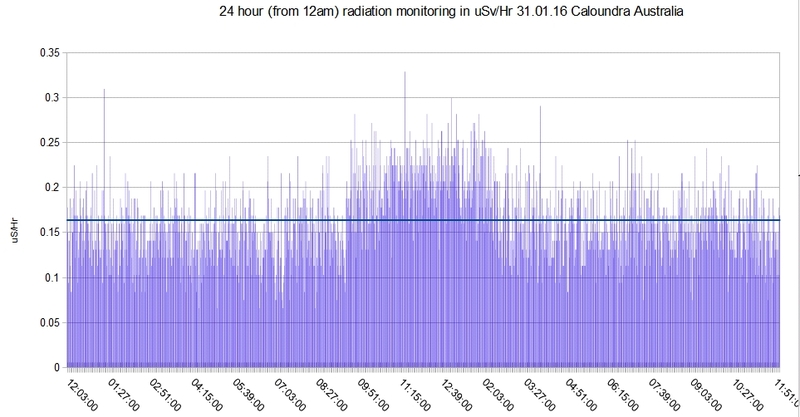 Southern Hemisphere 2015 Year Background Radiation Report. 2015 – was 18% above the 4 year pre-Fukushima local average. 2014 – was 20% above the 4 year pre-Fukushima local average. 2013 – was 22% above the 4 year pre-Fukushima local average. 2012 – was 21% above the 4 year pre-Fukushima local average. In 2015 test results indicated some of the increase in November and December local background levels were possibly from increased Southern Hemisphere volcanic activity. Even taking this into account, the data indicates a gradual decline in local background atmospheric detections from the previous year’s peaks, since Fukushima. This short animation of Northern, and Southern Hemisphere air circulation, shows why we can get atmospheric detections so far south. I have also conducted a number of local beach sand, seaweed, and Pacific Ocean plankton tests. If any Fukushima Pacific Ocean Cesium contamination has reached this location, it is at levels below the detection sensitivity of the test equipment used here. The scintillator test equipment used here is way more sensitive than an average Geiger counter, but it is not as sensitive as the very expensive test equipment available to research or university scientists. Detailed local background level month and year charts from 2007 to 2015, can be found here. 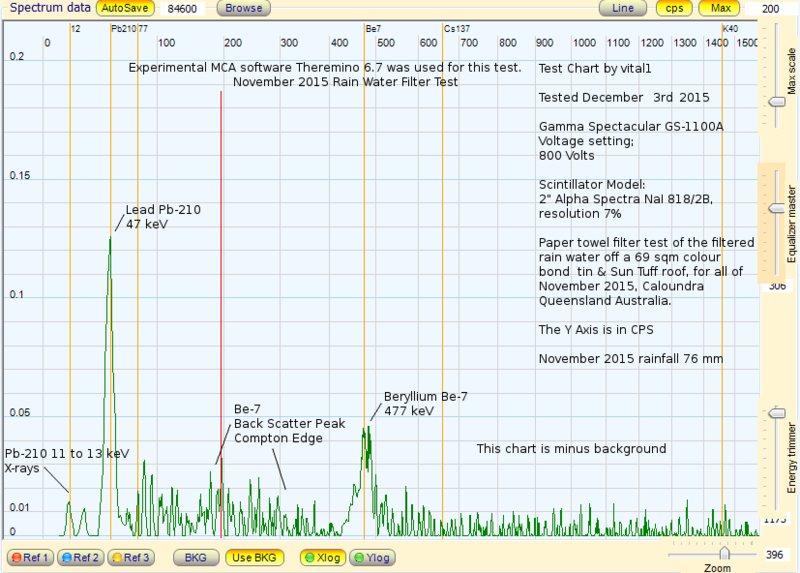 The December 2015 down pipe rain water filter test shows the usual Lead Pb-210 and Beryllium Be-7. December 2015 rainfall was 54mm. This is less than the rainfall for November 2015 76mm, but there was more Pb-210 detected in December.